Today celebrates National Bittersweet Chocolate Day and we can help but recall the pizzelle cookies made this past holiday season. A great make ahead treat, pizzelles are a unique sweet to bring to any gathering. Although labor intensive, they satisfy any sweet tooth’s desire. The word pizzelle means, loosely, “small, flat, and round” in Italian. These waffle-type cookies are made by pouring batter between the two plates of an iron, which is then held over a fire or heated electrically. The citizens of Salle, in the Province of Pescara, celebrate the festival of Beato Roberto every July. Celebrants walk down the street carrying branches on which pizzelle are hung as an offering. In Cocullo, in the Province of L’Aquila, the celebrants eat pizzelle during the festival of their patron saint, Domenico. They cover his statue in snakes and carry it around the town. These days, pizzelle can be found at almost any celebration in the Abruzzo region and across Italy. It is a rare Italian wedding that does not serve pizzelle at the sweets table. These cookies are closely associated with family; in fact, pizzelle irons have been fashioned with the pattern of a family’s crest. Pizzelle are also popular in countries with large Italian populations, such as Canada, the U.S.A., and Australia. Mix butter, sugar, and eggs together until well incorporated. Add lemon and vanilla extract, rum, and anise seeds. Mix well to ensure all ingredients are evenly distributed. With mixer on low, slowly add flour 1 cup at a time. To add additional flour, remove dough from mixer, work with your hands making sure dough does not get too dry. Dough should be moist but not stick to your hands. Roll dough into small marble sized balls. 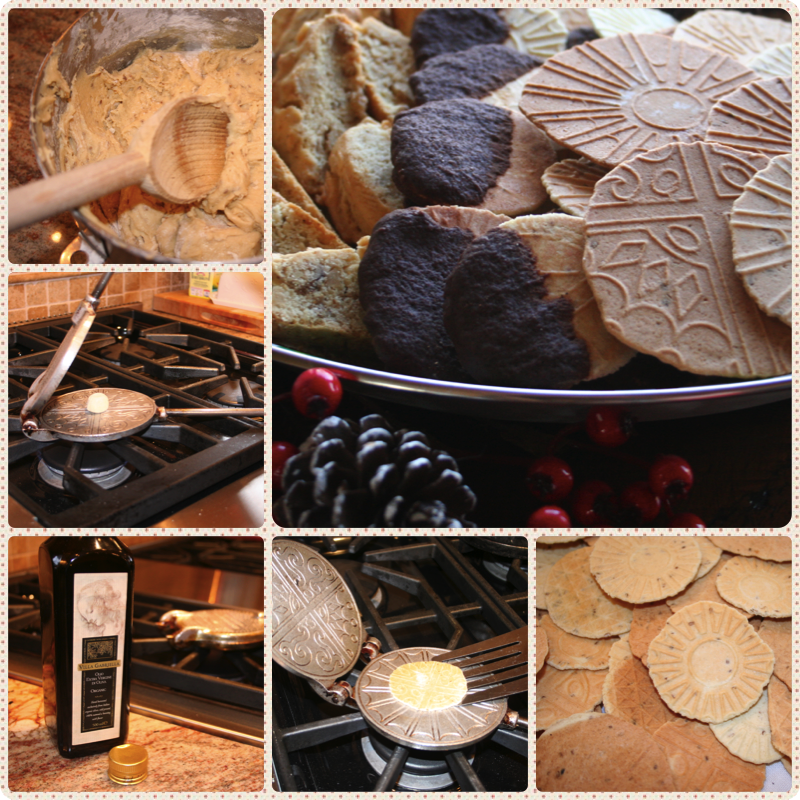 Prep the pizzelle press by rubbing with Villa Gabriella Extra Virgin Olive Oil. Place over low-medium heat until hot. Place one dough ball onto the pizzelle press and close. Heat until lightly golden brown, flip the press and heat the other side. Remove pizzelle cookie from the press with a spatula and let cool. Melt the chocolate and cream together in a bowl set over simmering water until just melted. Stir and remove from the heat. Dip each pizzelle in the chocolate and set aside on waxed or parchment paper to dry.